In Chapter XVI of his first Life of Saint Francis , Thomas of Celano wrote that Francis had one brother confront the Emperor with a reminder that earthly glory is transitory, while the other brothers and Francis avoided the allure of worldly power and remained in prayer in a hut by the road as the Emperor passed by. Upon his return from Damietta, Francis himself wrote A Letter to the Rulers of Peoples entreating them to put prayer and attention to the God's commandments at the heart of all that they do. Prophecy and prayer marked the beginning of our Franciscan movement. Prayer and the prophetic telling forth of God's truth remain at the heart of our proclamation of the Gospel we profess. The attached Franciscan Plea for the Soul of America, on the part of your Ministers, attempts to continue our eight hundred year tradition of proclaiming the Gospel. We ask you to reflect upon it and to share it widely as a means of marking the Feast of St. Francis this year, and we pray that you will be truly blessed in your celebration of the Feast and in your living of the Gospel. Justice for the poor, respectful care for the environment and courageous peacemaking have been the hallmarks of the Franciscan Movement since its beginning 800 years ago. St. Francis of Assisi freely chose to live a radically simple lifestyle among and with the poor; called himself a brother to all creatures and to the earth itself; and crossed religious and cultural frontiers to dialogue with a Muslim leader in an attempt to prevent another bloody war. St. Francis rejected the societal-economic shift of his time that valued financial success over human dignity. Today these values continue to inspire and guide Franciscans. They also inspire millions of people in the U.S. and beyond—people of faith and other people of good will. They demand action in promoting a consistent ethic of life that embodies a Common Good built on the foundation of full respect for all stages and types of life, and without a false ranking of these stages of life. The current direction of the United States is diametrically opposed to these values. Impoverished people are dismissed from our public discourse. People of color continue to experience a system of racial oppression. Refugees seeking haven in this country are refused a fair hearing, are separated from their children, and are confined in jails or cages before being sent away. Modest steps to heal our suffering planet are dismissed or undercut by short-sighted public policies. The warnings of science regarding air, land and water, and the very survival of humans as part of the earth community are ignored. And constant belligerent rhetoric, including threats of nuclear devastation, issue forth from current U.S. American politicians. Equally ominous is the gradual but purposeful dismantling of U.S. political values. Freedom of speech and an independent media are vilified; judicial processes are ridiculed; and respectful public discourse is a lost art. Some public leaders would rather provoke outrage than provide accurate information. It is more common to dehumanize, demonize and marginalize the most vulnerable of our world rather than to address difficult and complex issues. A seemingly-successful economy for some people is perched on the vast and growing disparity of wealth in the U.S. and wider world, and on total disregard for ecological sustainability. We are witnessing an untenable situation where all political sides find it impossible to dialogue with civility, reach workable compromise and move a public agenda forward to address the challenges of our day. For the Common Good to be realized, change is needed across the political spectrum. As Franciscan friars living and working in the United States at this moment in history, we feel obliged to reject—and to speak out loudly and clearly against—all such policies and practices that so flagrantly violate our Franciscan values and the basic principles of Catholic social teaching. We feel compelled to live out our Franciscan charism of repentance in response to the profoundly unjust and destructive public policies our country is adopting. This will require soul searching and the contemplative discomfort that leads to transformative action. We, who love the United States of America, must act against an all-encompassing threat to the very soul of our beloved country. We will increase our work for justice in the public arena, including in the electoral process, clearly setting ourselves at the side of those who are excluded—namely, immigrants, women, people of color, the earth community and impoverished people—and supporting their full engagement in the public discourse. We pledge anew to live the Gospel boldly, so as to ensure public and private respect for the dignity of every person and the integrity of creation. 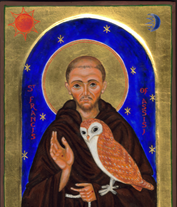 In the spirit of St. Francis of Assisi, where there is hatred, we will attempt to sow love; where there is injury, healing, where there is despair, hope; where there is darkness, light; where there is injustice, reform; and where there is sadness, joy. I write this in late August about how the Catholic Church responds to clerical sexual abuse and the bishops or superiors who have enabled it. The Church in the United States is reeling from the revelation in July that former Cardinal Theodore McCarrick sexually abused a minor and later seminarians and priests. This month a grand jury in Pennsylvania released a report documenting that 301 priests and religious in six dioceses abused over 1,000 minors. You certainly deserve our gratitude for the swift and comprehensive way that you have denounced past abuse, are speaking with survivors regularly, and are working to prevent further abuse. This crisis weighs even more heavily on your heart than it does on mine. Thanks for your August 20 “Letter to the People of God.” I look forward to your next steps in implementing the contrition expressed there. So, who is writing this letter? A Franciscan priest ordained 43 years, an editor of this monthly magazine for 19 years, and a Catholic heartsick about a crisis that continues to hemorrhage the Church’s credibility in all areas. Between late 1985 and early 1992, I worked at the general headquarters of the Order of Friars Minor and processed all the official correspondence between the Holy See and our order. I have some sense of how the Roman Curia operated then, usually very conscientiously. Many US Catholics date their awareness of clergy sexual abuse as a systemic problem to January 2002, when a tsunami of accusations swept away the “It’s only a few bad apples” explanation. A National Catholic Reporter series in 1985 addressed abuse in the Diocese of Lafayette, Louisiana, but accurately suggested such abuse may be a national crisis. This magazine’s February 1994 issue contained our first article on this topic by John Feister. Our “Church in the News” column gives national and international news items about the Catholic Church. Since January 2002, our 202 issues have contained 169 “Church in the News” items (some a few lines and others a full page) about this abuse. Our June 2003 special issue was entitled “Crisis in the Church: Our Search for Healing.” During those same months, we have published another 15 articles and 13 editorials on this topic. Many Catholics expect a prompt reporting to civil authorities of every accusation, cooperation with those authorities, and severe consequences from the Church in cases that cannot be prosecuted in civil courts because of the statute of limitations. It’s time for us to put more meat on those bones! Never has it been more obvious that genuine peace is a work of justice. I’m sure you would agree that we cannot hope God will do what God rightly expects us to do. We all know that no one—not even you—can change a past event, but each person—again, including you—is responsible for how he or she responds to a past event once it becomes public knowledge. Institute a tribunal independent of any existing Vatican office to conduct all canonical trials concerning bishops who commit such abuse or fail to act effectively after receiving complaints of clerical sexual abuse. Draw up a code of conduct to be accepted by a bishop before his ordination, specifying how any future com- plaints cited above will be handled by the Holy See. Take what you have learned—especially from the incomplete information provided to you in the case of bishops in Chile—and make this part of the work of the nine cardinals advising you about the reform of the Roman Curia and the governance of the worldwide Church. Responses at the national level are good, but they will always be inadequate. Some new worldwide juridical mechanism is needed to address these situations. Ad hoc responses thus far have not brought about the changes needed. Also, appeals from the new tribunal that I have suggested need to have some time limit for resolution. Last March’s sentence against Archbishop Antonio Apuron of Agana, Guam, is still being appealed as I write this letter. Regarding my second suggestion, the Holy See already specifies for its direct employees the procedures and penal- ties for handling such abuse or negligence. That code of conduct has not been applied to bishops, archbishops, and cardinals who do not work directly for the Holy See. My third suggestion will take the longest time to implement. In fact, it is the most important. These and other structural changes are urgently needed in order to restore the Catholic Church’s credibility. Your May 31 letter of apology to the Church in Chile suggests that the whole process of appointing bishops needs an overhaul. Please know that millions of Catholics around the world are supporting you in prayer and will support whatever changes you judge, before God, to be needed at this time. I pray especially that, by the time you receive this letter, you will have taken the first steps for a more effective response to clerical sexual abusers and the superiors who have protected them. 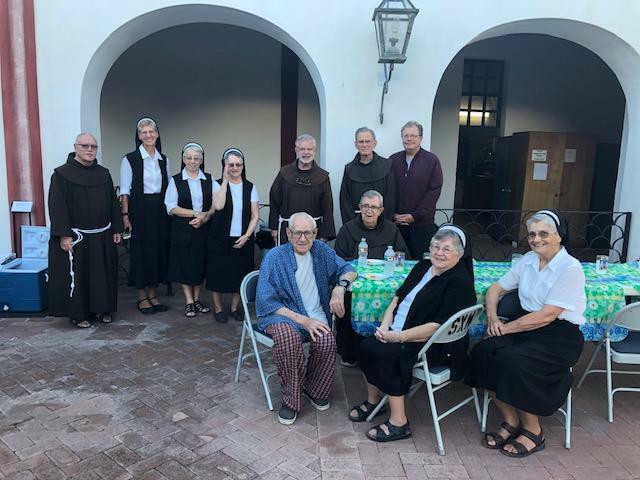 The friars and sisters gathered together for an outdoor supper just before celebrating Transitus together. In the group photo here are: (back row- L to R:) Manuel Viera, OFM; Sister Mary Ann, OSF; Sister Leonette, OSF; Sister Rosalie, OSF; Eddie Fronske, OFM; Max Hottle, OFM; Dennis Bosse, OFM; (Seated- L to R) Clifford Herle, OFM; Stephen Barnufsky, OFM; Sister Ellen, OSF; Sister Carla, OSF. The photo below is of the Transitus service. The Solemnity of our Seraphic Father, Saint Francis of Assisi happily coincides with the beginning of the Synod of Bishops, convened by Pope Francis, whose theme is: Young People, the Faith and Vocational Discernment. It is a time when young people are at the center of the Pope’s heart, as well as of the whole Church. If we look at the ways in which our Seraphic Father experienced his youth — his restlessness and his searching — we can see a profound connection between that young man of 800 years ago and the youth of today, since the sacred soil of the human heart is no different now than then. The way in which St. Francis was able to respond to the challenges of his time can bring light to the search in which young people are today engaged, as well as being “an invitation to seek new paths and to journey along them boldly and trustfully, keeping our eyes fixed on Jesus and opening up to the Holy Spirit, to rejuvenate the very countenance of the Church” at this time of epochal change ( Instrumentum Laboris, Synod on Youth, 1). Dear Brothers: " Greetings in the Lord, and Peace!" The call to Francis, " Go and repair my church which, as you see, is falling into ruin" was clear to him. He went off, gathered stones and rebuilt San Damiano. As time went on he and his followers saw in this call something less literal. 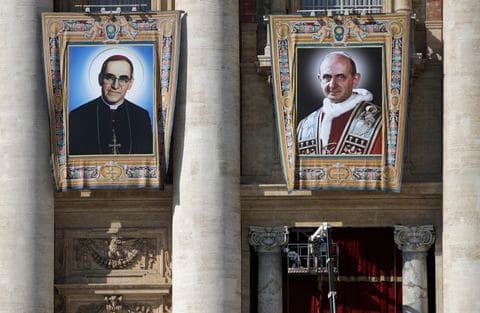 Francis saw a church full of problems, abuses of power and resources, lack of outreach to the poor, and worst of all, a malaise in proclaiming the Gospel. It was a time of wars among powers, and although prosperity was coming to many parts of Europe and to some people, it was not a world of equality or opportunity for the vast majority. We may become saddened, even frightened by the world we find today. There are struggles for power among political parties, the growth of the economy for some but not the majority, the continual wars throughout the world, and scandals both inside and outside of the Church. But none of this is new. We may romanticize the past, when our immigrant ancestors came to a place of opportunity and equality. We forget that in every generation there has been prejudice and struggle. Our Italian ancestors (' without papers') were not welcomed with opened arms, hoping that they would open upscale eateries. The Irish who, " need not apply" were not sought out for election to unions or political parties. The Church too, was not without its problems. Although less visible, the stories in today's news have dated back centuries. Perhaps perspectives and sensitivities and the manners in which we deal with things have changed, but the Church is a collection of broken and sinful people, not purified saints, struggling with God's grace to encounter Him and accept the incredible gifts of love and grace that he gives us. There was no panacea in the past and there is none now. Perhaps the biggest difference between now and the recent past is immediate access to knowledge without an equal access to wisdom.
" All highest, glorious God, cast your light into the darkness of my heart. We, as Church, a country, an order, a province, a fraternity, as people, must look toward the crucified Lord in this time of trial. We must embrace death, death to power, privilege, and prestige. Death must be embraced as part of our own flesh, as our sister. It is in our pain and our sin that we proclaim that it is in this messy, disgraceful, filthy death occurs and the resurrection takes place. This article original appeared in The Padre Trails newsletter (October 2018) of our sister province, Our Lady of Guadalupe, as part of an ongoing series, “Into Our Tradition: A monthly Reflection from Our Franciscan Heritage”. Many thanks for permission to reprint.—ct. Write that I bless all my brothers, [those] who are in the Order, and [those] who will come until the end of the world. ... Since because of my weakness and the pain of my sickness I am not strong enough to speak, I make known my will to my brothers briefly in these three phrases, namely: as a sign that they remember my blessing and my testament, let them always love one another, let them always love and be faithful to our Lady Holy Poverty, and let them always be faithful and subject to the prelates and all clerics of Holy Mother Church. If we listen, Francis is still giving us his vision of how we are to follow the inspiration that led him to such holiness of life and such an impact on the world around him. First, “let them always love one another.” In other words, Francis recalls the oft-repeated words of Christ whose commandment was to love one another, and whose greatest commandment, after love of God, which Francis will also echo, . . . (was)to love your neighbor as yourself. Second, Francis told his brothers “be faithful to our Lady Holy Poverty.” In other words, live a life without appropriation and without accumulation, be humble, be lesser ones going through the world. And third, go through the world as a Catholic, “be faithful and subject to the prelates and all clerics of Holy Mother Church.” For it is the prelates and clerics who bring us the fullness of the Sacraments, clerics who at their best incline us toward God and who, even at their worst, provide a direct means of touching God in the flesh. 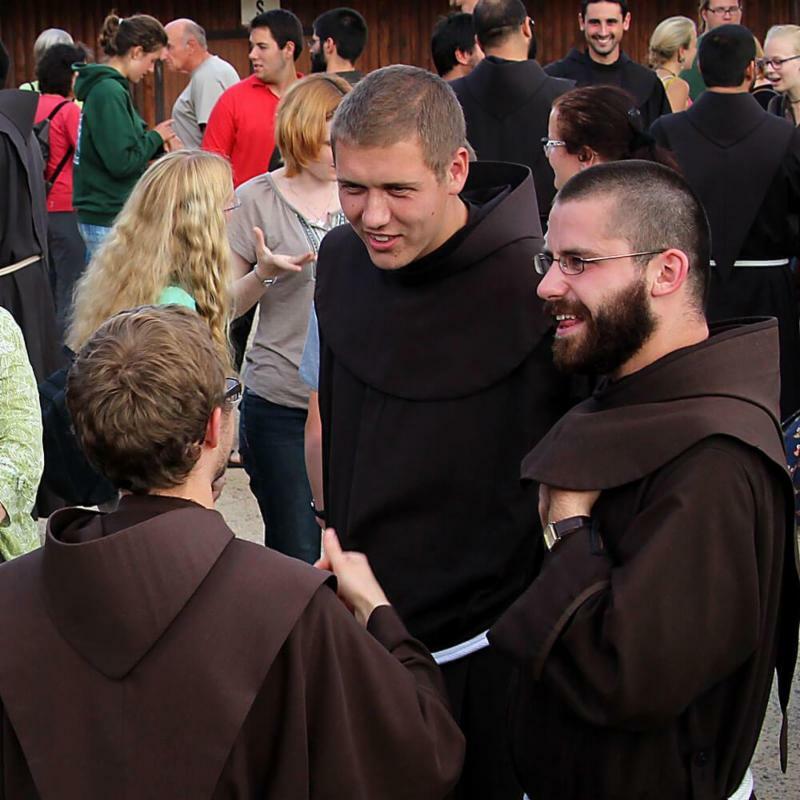 Those three phrases can almost be summed up in one phrase: “ Be friars (brother) minor (without appropriation, poor), faithful, and subject to the very human Church (prelates and clerics). We live in a time when the very human aspect of the Church and its human leadership can almost lead us to doubt and despair, but Francis lived in such times as well. He was a reformer of a Church which had grown rich at the top while poorly serving those at the bottom. The Church of his time, as well as in ours, seemed all too often to be about the appearance of perfection, rather than attaining the perfection found in love. Francis saw through pretense and posturing to know that the Reign of God is built not on power structures, but on loving relationships. To seek to attain perfection requires a desire for relationships of love. The friars and all Christians are first of all related to God as Creator, Redeemer and Sanctifying Spirit, relationships of love as close as the best of mothers and fathers and spouses, all terms that Francis used to describe our relationship with God. Those relationships subsume power in love, so that we may do for love alone what we know God wants us to do. If we remember our call to do what is right with regard to all of our sisters and brothers: the great and the small, the powerful and the weak, human beings, creatures and Mother Earth herself, then we will remember the blessing of Francis and his legacy, his testament. We can make great sacrifices to do what is right because of love; sacrifices that we would not otherwise make. Fear of God, fear of power of any sort leads us to do the minimum that we can in order to get by. Love for each other and love for the God Who has made each of us leads us to do great things, not minimal or half-hearted things. Arrogance never attracts anyone and never inspires. Humility both inspires and attracts others. It is a sin to boast of poverty, as much as it is a sin to boast of wealth or power. The love of our Lady Holy Poverty opens our hearts to see that God alone is the Giver of the gifts that I have to share with others. Francis mentioned once that the only thing which we take with us when we die are our sins. That can be a frightening thought, until we realize that in the embrace of God’s love, once we die, those sins will be obliterated. They will be gone from history and from eternity forever, if we humbly seek and accept God’s forgiveness; if we embrace and hold on to our own poverty, our own powerlessness. Taking our sins with us when we die is a means of getting them out of the world, out of the way of others, of transforming them so that they will not be transmitted to another generation. But the only way that we can take them with us is by acknowledging them, not arrogantly hiding them behind pride and the appearance of perfection. 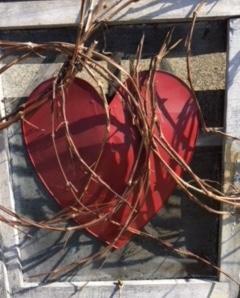 To open ourselves to the scrutiny of others, so that they can see us warts and all, requires great trust --- and great love. In that love, in the gifts of love that we give to others during this lifetime are found the things that we leave behind. We cannot take our acts of kindness, our acts of charity, or even our acts of courage with us. They only become acts of kindness, charity and courage when we give them away. “Let them always love one another.” What Francis had to say has come full circle. Francis called us first, last and always to love one another as brothers, and as brothers to love others as sisters, too. Friars Minor in the Church – always brothers first, humbly second, and always in the Church. Francis still has so very much to say to us! 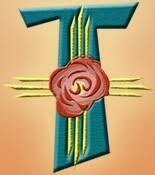 Dear Brothers: I am a former Franciscan student from Guaymas (Mexico). I attended the pre-novitiate program and lived at Highland Park many, many years ago. Even though I was never brave and generous enough to become a friar, I am very graceful of those years. 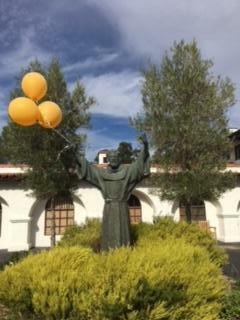 Now I am married, got a doctoral degree (from UCLA) and teach at the University of Sonora, but still I try to follow Saint Francis's teachings as much as possible. This historical union will merge the two Canadian Franciscan provinces into one entity facing a future that is rich with promise. During this Liturgy of the Word, the name of the new leader of the province, known as the Minister Provincial, will be announced. The new logo representing the new entity will also be unveiled at that time. Following the union of the two Canadian Franciscan provinces, the new province will include 87 Franciscan brothers from the ages of 32 to 97. Currently, Canadian Franciscans are present in Quebec (Montreal, Lachute, Trois-Rivières), British Columbia (Vancouver and Victoria) and Alberta (Edmonton and Cochrane). Jean-Pierre Ducharme, ofm, a member of the transition committee. On May 15, 2018 three friars arrived in Havana, Cuba, to form a new international fraternity in Holy Cross parish. As well as offering support to the Cuban members of the Custody of St. Mary of Hope (3 Solemnly Professed friars and 6 in Initial Formation), Friars Manuel Pineda (from Guatemala), Francisco Gearóid Ó Conaire (from Ireland), and Jesús Aguirre Garza (from Mexico) will explore possible future presences and ministries. Their criteria will be the needs of the local church, discerned in line with our Franciscan charism, guided by the Order’s document, Ite Nuntiat’, and with an emphasis on Justice, Peace and Integrity of Creation (JPIC). Other friars have expressed interest in being part of this initiative. 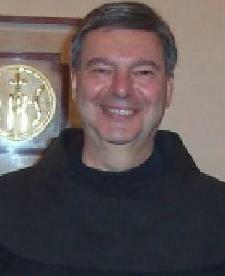 In dialogue with the Custos, Friar José Santos Pérez, friars are encouraged to come, visit, and discern for three months before making a final decision. The fraternity will present proposals regarding present and future international initiatives in Cuba to the Custos and the Minister General in July 2019. In the meantime, as well as serving in a parish, they will meet with many people and groups around the country, as well as experiencing Cuban realities firsthand. 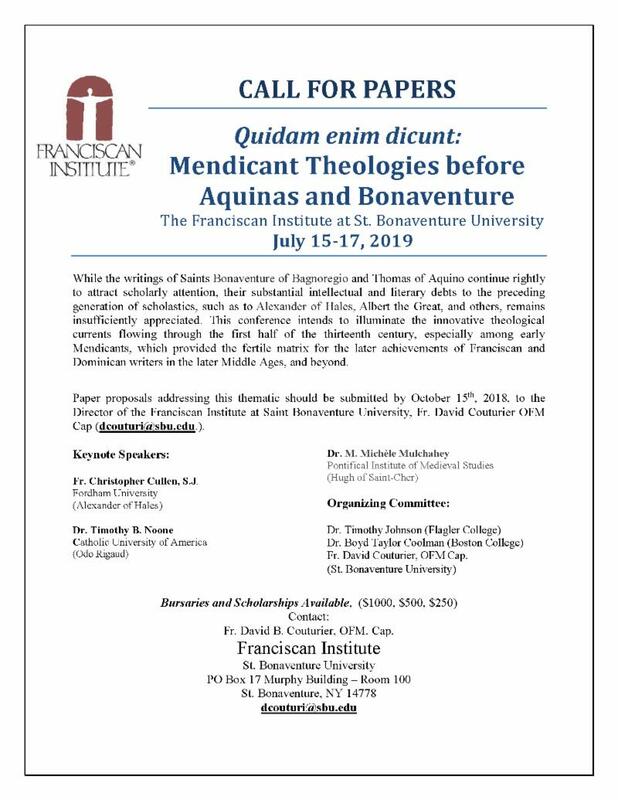 For further information, please contact Friar Luis Gallardo, General Secretary for Missions at lgallardo@ofm.org or Friar Ignacio Ceja (General Definitor) at iceja@ofm.org for more information. Friars from the Province of St. Barbara who are interested in the Cuba mission are asked to contact Provincial Minister David Gaa directly. Unification is not an easy task. 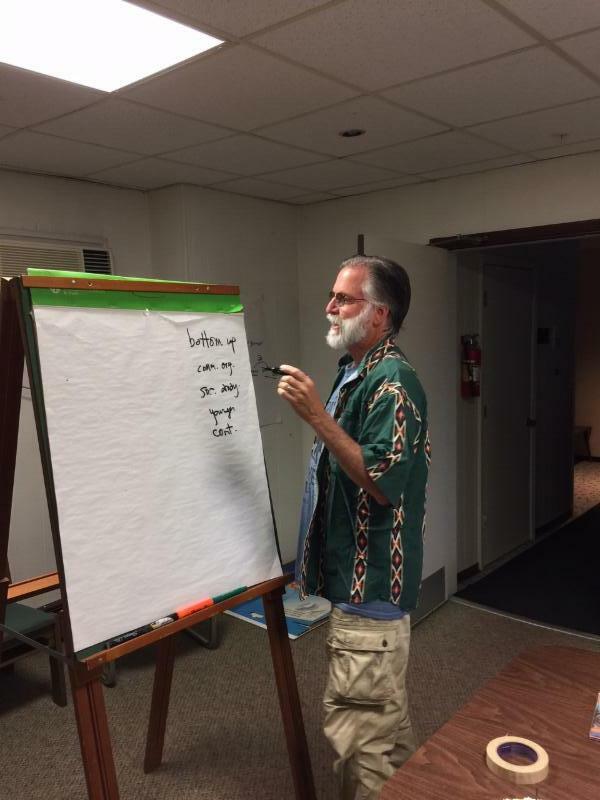 That’s what animators from six U.S. provinces discovered when they gathered in Cincinnati Sept. 11-12 to begin the process of forming a national office for Justice, Peace and Integrity of Creation. 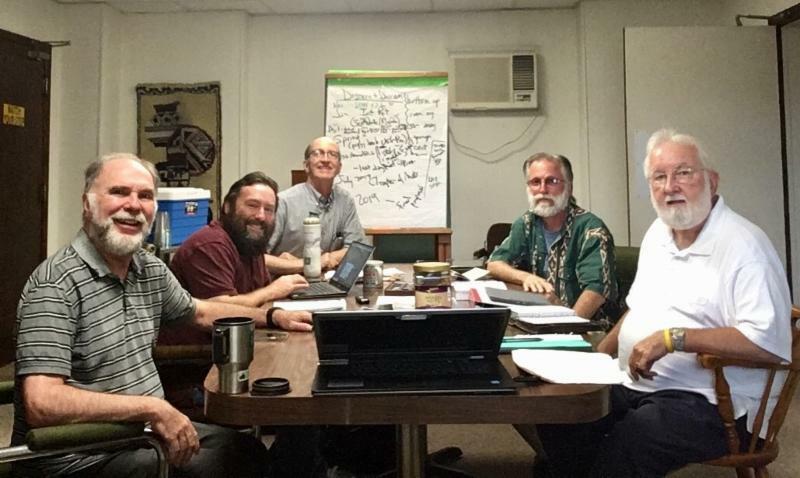 Their goal: “Bringing together the diversity of JPIC in the different provinces into a new, cohesive shared model,” according to Friar Russell Testa, Holy Name Province animator and chair of the US–6 group. Hosted by Friar Scott Obrecht, JPIC animator for St. John the Baptist Province, representatives met at historic St. Anthony Friary and National Shrine. 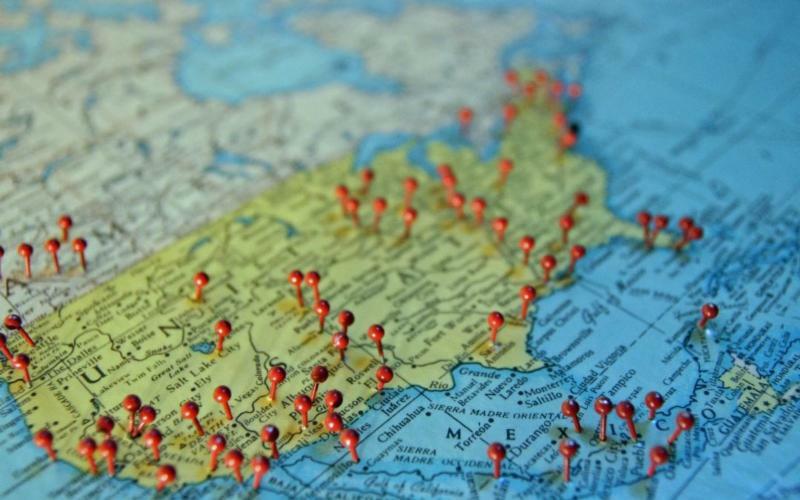 Reflecting the geographic range of their provinces, participants came from California, New Mexico, New York, Maryland, Wisconsin, Indiana and Ohio. Maintain our Franciscan values as we evaluate current JPIC ministries and decide which ones to take on in the future. A timetable and proposed process leading up to a final proposal will be sent to the US–6 provincials for their input. Then, it’s back to the drawing board. Besides creating a model for this new national JPIC Office, animators spent a significant amount of time drafting a document that will be sent to the Secretaries of Formation of the US–6. They consider it crucial to integrate JPIC into all of formation, especially initial formation. This is a critical time to weave Justice, Peace and Integrity of Creation not just into the curriculum but into our lives as friars. Friar Jud Weiksnar of Holy Name Province, the “mover and shaker” in researching and writing the document, is passionate about this issue. 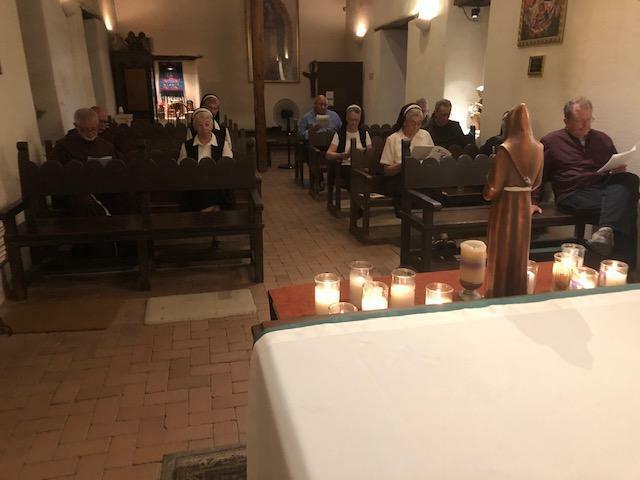 “This is an effort to create the possibility that all of our friars will find some area of JPIC that they are deeply interested in, and they can work together with the people they minister with and the people we serve in our ministries,” Jud said. While they were in Cincinnati, the JPIC animators took an evening off to tour the city and experience the local cuisine. Cincinnati is famous for its Greek-inspired Skyline Chili and family-owned Graeter’s ice cream. A meal of “Five-Way Chili” (spaghetti, chili, cheese, beans and onions) was followed by a dessert of Graeter’s ice cream with huge chunks of chocolate. It was the perfect ending to the first day of discussion, deliberation and decisions. As JPIC animators discovered, there are many factors to consider in creating a national office. Each province has its own “personality,” has different ways of doing things and in many cases works with people of different cultures. Specific justice issues are important in each region. There will be a lot of “letting go” as this new office is created. What will guide this new entity? What will give it direction? What will be the final product that the JPIC animators and their provincial ministers create? Friar Mark Schroeder from St. Barbara Province is also the JPIC Animator for Our Lady of Guadalupe Province. 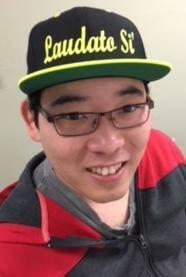 Having worked with people from many different cultures, he knows that bringing them together is much like bringing together friars from different provinces. What will hold this new structure, this new national JPIC Office, this new province, together? 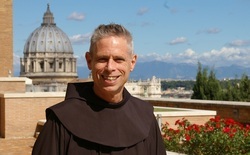 “All friars follow the Gospel,” Mark said. “If we follow the Gospel then we will be culturally sensitive. JPIC work is always about the ‘Anawim’, the less important, ‘the poor and lowly ones.’ We have a preferential option [for] the poor in our society, and that should be our priority.” So let the Gospel lead us. Provincial Minister Jim Gannon of Assumption of the Blessed Virgin Mary Province is the Provincial Liaison to the ESC-JPIC Animators. He participated in the Cincinnati meeting at various times via telephone conference. Jim had planned to drive to Cincinnati from Milwaukee, but was unable to attend because of a change in his schedule. 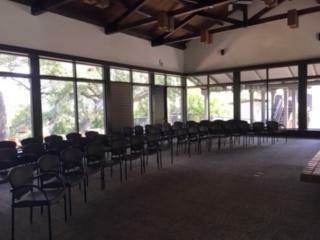 This first week of October, some 30 volunteers are hard at it freshening up things at San Damiano retreat as part of their annual “work retreat”, organized by the new Executive Director Peter Wise with the spiritual assistance of Friar Rusty Shaugnessy. Last week, the friars celebrated the Transitus/ Feast of St. Francis with a prayer service on the vigil followed by Eucharist on the morning of October 4. 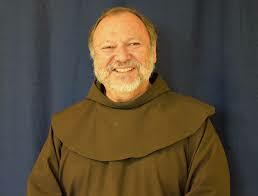 The following day, Friar Charles Talley led some 40 participants in a three-day retreat on the theme of “St. Francis/ Pope Francis”. In the midst of that event, Friars Rusty Shaugnessy and Philip Garcia welcomed pet lovers to the annual blessing of critters. 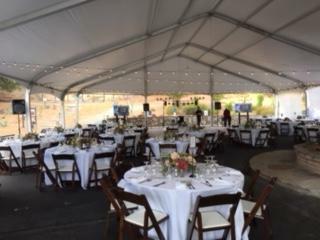 As if that were not enough, just two weeks ago, the Retreat hosted its second annual “Evening Under the Stars” gala fundraiser on September 29, drawing about 200 friends and benefactors to the 55-acre hillside location in Danville. Attendance more than doubled last year’s event and a sturdy tent was “pitched” in front of the Retreat’s main building to accommodate the expanded crowd. Former director, Friar Ray Bucher was on hand as well to “meet and greet” and help animate the crowd. 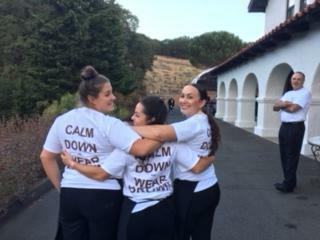 Everything went amazingly well as staff, administrators, volunteers and friars all pitched in to make the event one of the Retreat’s most successful “friend / fun/ fund” raiser ever. That said, the timing for the gala was perfect. Not only was the weather just right, but the Retreat community was able to celebrate the inauguration of its newly redone Fireside Lounge. Local angels descended upon the space with zest and relish as walls and ceiling were painted, fans installed, new carpeting and “curtains” installed, the sound system updated and the gas “fireplace” replaced with an electric version. By the end of the gala, everything was paid for—including the 150-odd chairs purchased to top off the restoration. The only disappointment overall was that Friar Evan Howard who, for health reasons, recently moved to Mercy Center in Oakland, was not able to be present. 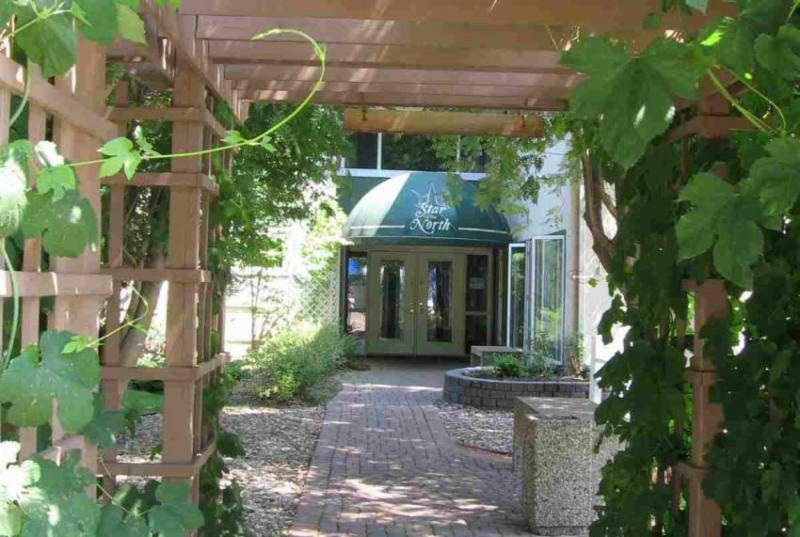 What’s next at San Damiano? Just stay tuned. Enrollment for classes, lectures, and retreats is going well. The recently planted orchard on the hillside facing the main entrance is now, quite literally, beginning to bear fruit. And the friars’ living quarters are getting a new look with upgrades to the sacristy, kitchen, dining room areas, and several of the friars’ rooms. 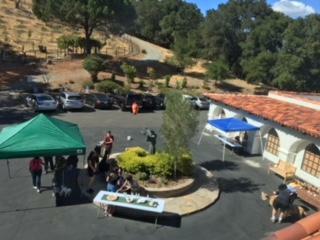 In fact, the folks at San Damiano a getting a lot of what they need right now—except for rest! After all, even retreat folks need a retreat! Amen! 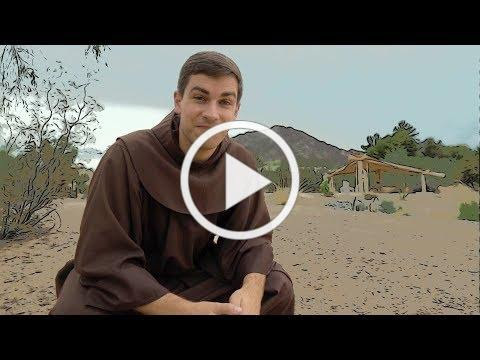 The Franciscan Renewal Center in Scottsdale, Arizona is featured as both the subject and backdrop for the latest most recent vlog (video blog) produced by the energetic and prolific Holy Name province Friar Casey Cole. 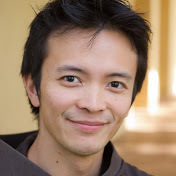 Cole made his first breakthrough in social media with his popular Breaking the Habit: Reflections of a Friar in Training series. 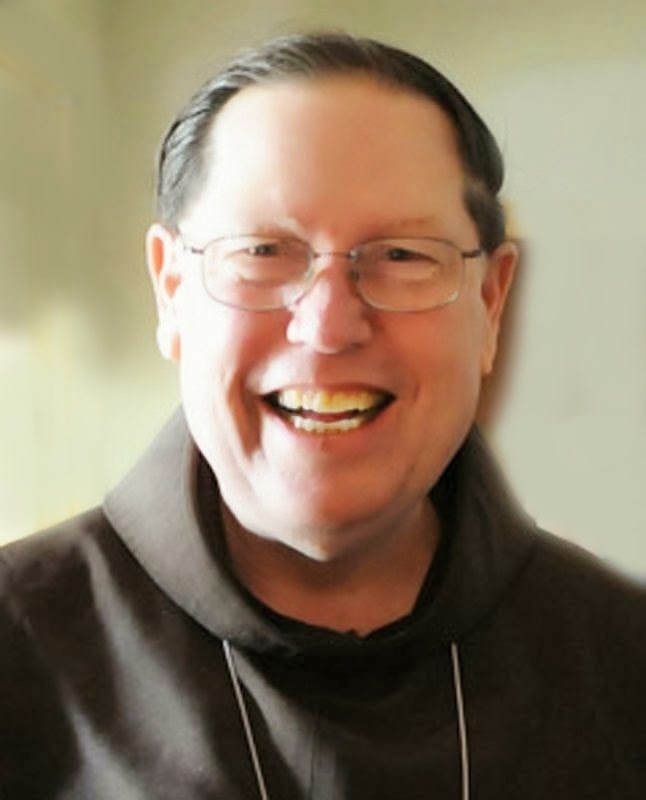 That work has since as an accessible, view-friendly source of information about the Franciscans as well as an attractive vehicle for vocations promotion. Ordained deacon earlier this summer, Casey is currently studying at the Catholic Theological Union (CTU) in Chicago. This most recent video was produced in conjunction with his recent retreat “Why Be Franciscan?” (September 28-30) at the FRC. Brothers, be sure to register for and attend either of the Fall Convocation events! And while you’re there, be sure to stay for the event organized by the Chapter Steering Committee which will take place on Wednesday of each of the convocations! In the meantime, here are some more responses we have received from fraternities from their house conversatios: CLICK HERE FOR CONVERSATIO FEEDBACK . 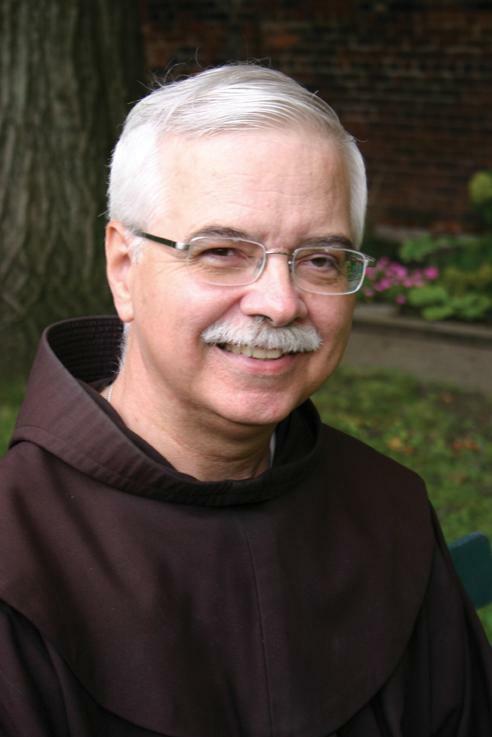 OFM Minister General Michael A. Perry, on behalf of the General Definitory and the Brothers of the Order, congratulated the newly elected General Minister and assured him that he will be remembered in prayers for the future ministry that awaits him in the service of the Capuchin brothers.